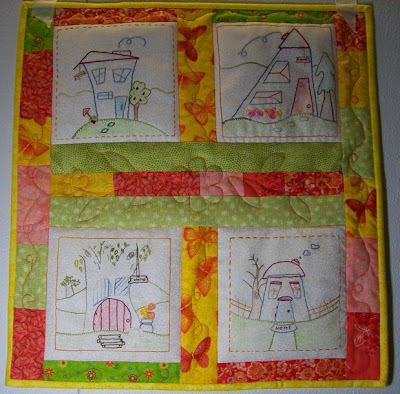 Jenny of ELEFANTZ: Shabby Roses BOM News and some finished Wonky Houses! Shabby Roses BOM News and some finished Wonky Houses! The other news is that because there are 12 blocks in the BOM I will be leaving the free downloads for everyone in sets of 3. When Blocks 4 & 5 are released on June 1st I will take down the links to blocks 1,2 &3. So if you need to download the first 3 blocks please do so before then. Here are the current links for the first 3 blocks whilst they are available. I'm sure you will have fun with the double blocks on June 1st! Last night I finished all the block designs, now to stitch the last few, then I can begin putting the quilt top together. Once I've done that I will share with you the amount of fabrics used to complete the quilt - I'm hoping to share that before the release of block 6 on July 1st. Remember, you will need 1 yard of the pink tone-on-tone fabric for the 12 embroidered blocks. Once again, you ladies have blessed me! 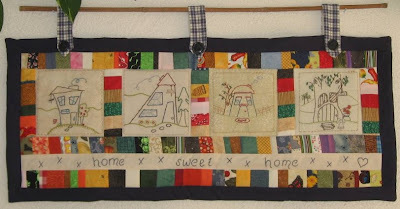 Katrin and Marie-Joze sent me photos of their completed Wonky Houses and they are fantastic!! I just had to show you all! Jenny I am so glad to hear we'll have two blocks in June, I love these sweet blocks. Thanks for sharing so freely with us all. those houses are amazing. can't wait to see June's blocks. When you mentioned removing links to the first 3 blocks I paniced because I didn't have them...of course it would help if I read carefully. I did have them printed out though, I just hadn't put them in my pattern book yet LOL. I look forward to the June double whammy...woo hoo! !